ETH students: Arthur de Buren, Jonathan Egli, Corinne Räz, Nils Franzini, Lukas Loosli, Kathrin Röthlisberger, Géraldine Burger, Aurelia Müggler, Sonja Flury, Allegra Stucki, Michèle Brand, Jan Engelke, Michael Furrer. ETH Prof. P. Ursprung Chair: Mathias Brühlmann, Berit Seidel. Fabio Don and the partecipation of Suad Amiry, Virginio Bettini, Lucrezia Cippitelli, Lieven De Cauter, Anna Detheridge, Marco Favaro, Martin Josephy, Peter T. Lang, Alessandro Mulazzani, Michael Obrist, Lisa Parola, Pelin Tan. Whoami Lucia Giuliano, Stefano Mirti advisors: Yulia Besplemennova, Marco Lampugnani, Aurora Rapalino. Relational Design Master students: Evelyn Leveghi, Diego Facta, Claudia Garrone, Francesco Fanetti and activists and citizens organizations in Venice: Comitato Teatro Marinoni Bene Comune, Lido d’amare, LIPU sez. Venezia, Gruppo Vegan Venezia, Gruppo Skaters Venezia, Aquarium, Estuario Nostro, and Venetian Heritage Communities: Associazione Poveglia – Poveglia per Tutti, Forum Futuro Arsenale. The summer school opens up the discussion on the Biennale di Venezia 2016, by initiating the process of designing a Biennale Urbana, using, as reference, the Lucius and Annemarie Burckhardt 1980-82 project for Kassel Documenta Urbana. The Biennale Urbana is conceived as a startup to launch a process of reuse and reinvention of the enormous patrimony of abandoned spaces in Lido and in the all lagoon of Venice. The architecture students of ETH together with Stalker Walking School and selected artists, critics, curators, educators and citizens associations will collaborate in the construction of the Biennale Urbana 2016 project with proposals, strategies and tools discussed through seminars and workshops. 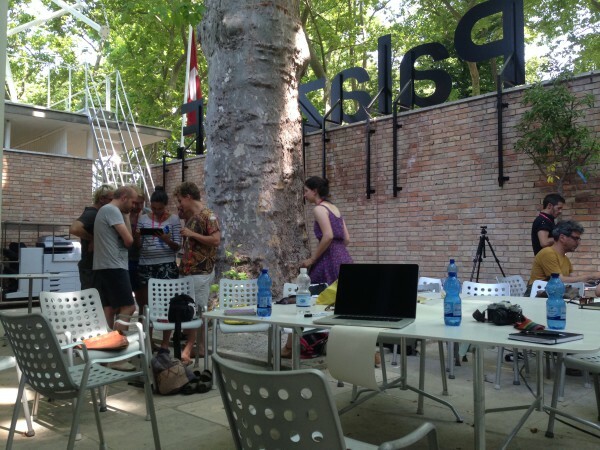 As final result, a catalogue of sites, tools, strategies and proposals for the upcoming Biennale will be edited. The Summer School will be held in collaboration with citizens association engaged in the preservation and reuse of public or ex public abandoned places. The Biennale Urbana Project for the ETH Summer School at Swiss Pavillion is part of the “Walking out of Contemporary, XXI cent. Grand Tour in search of a future for culture”, a SWS open and nomadic educational program that is taking place in open collaboration with international schools as ETH Zurich, HfG Karlsruhe, Parsons at New School, New York and Whoami. The Biennale Urbana will take place from June to September 2016. ACTUAL VS CONTEMPORARY Lido and the Lagoon are comprised of “Actual Territories”, as Stalker called in 1995 the system of abandoned places of forgotten memories, marginal presents and spontaneous emerging of possible futures. A world to explore, inhabit and map aside the “Contemporary” one. Simultaneous, decontextualized, instantaneous, exclusive events, seem to characterize the contemporary production of space, while in the “Actual Territories”, often forgotten, forbidden, refused and exploited spaces, through contextual, relational and processual practices, new creative communities are spontaneously experimenting strategies of coexistence, in search of more sustainable forms of culture, economy and democracy. Those collaborative, social and artistic, practices are indicating possible strategies to re enact those spaces, re creating a possible “Common sphere,” a space that arises amidst the decline of the public sphere and the blind privatization, or better exploitation, of any resource, practice and space whatsoever. The Biennale, the most important contemporary institution for the arts in Venice, and the “Actual Territories” could mirror one in the other, becoming reciprocal resources, text and context of a process of going back to imagine a future for Venice, beyond its contemporary cliché. June, 15th 10.00 am. – 18.00 pm. Journal design Final Editorial Work @ Swiss Pavillion ………………. Stalker Walking School is an Independent Educational Institution designing itself through on field educational paths in open collaboration, internationally, with Universities, museums and research centers and locally with artists, inhabitants, researchers, associations and institutions. SWS proposes, as educational tool, the Stalker “practice” developed in the last twenty years, by “walking across ” the physical, cultural, mental, socio economical, political boundaries that are dividing the contemporary world from its “invisible” context, done of what it refuses, exploits and reject, a parallel dimension named by Stalker “Actual Territories”. Stalker, a collective subject found in 1995, bases its researches and actions on the spatial practices of exploration, listening, and relating with local contexts, archives of memories and collective imaginaries. Practices activated through creative tools of interaction with the inhabitants and the environment, trying to develop awareness, capabilities, and new social behaviors and knowledge in facing social and environmental changes. stalkerlab.org, osservatorionomade.net, walkingoutofcontemporary.com, primaveraromana.wordpress.com. Suad Amiry is a Writer and an Architect (born in Damascus 1951). Suad Amiry is a prominent Palestinian figure: an architect a writer and a community leader. Amiry is professor of architecture and the founder of the leading cultural organization RIWAQ: center for Architectural Conservation (www.riwaq.org). She is the author of the prize-winning book: “Sharon and My Mother-in-Law” (Feltrinelli 2003, Premio Viareggio 2004). Amiry is the Vice President of Birzeit University Board of Trustees, Board of Trustees for the Palestine Investment Fund, and the Palestine Housing Council, Jury for The Palestine Award for Culture (headed by the late Mahmoud Darwiesh). Amiry was also a Member of the Palestinian-Israeli Washington Peace Talks (1991-1993). Lucrezia Cippitelli, Phd, is a scholar, art historian and curator based in Brussels. Professor of Aesthetics at the Art Academy of L’Aquila (IT), Visiting Scholar at Cornell University (Ny, US), cocurator of the project TIME_FRAME, Art, Technology, Contemporary Culture in Latin America and Africa (at Nimk, Amsterdam, IT). As scholar of Contemporary Art, Lucrezia focuses her research on Postcolonial studies, non-western artistic practices and the art system. As militant art critic and curator she works especially with media and conceptual artists and process oriented practices developed into social and public spaces. Lucrezia has a curriculum of researches, exhibitions, professorships and cultural cooperation projects, developed in several international Biennals, exhibitions, cultural centers, universities between the US, Latin America, Africa and Europe. She served as curator at MLAC (Rome, IT) between 2003 and 2007 and she writes about art at the edge of digital Avant-gards on “Digicult” (where she is also part of the management comitee member). She is author of “Alamar Express Lab” (Rome, Gangemi 2007), and co-editor of “Tania Bruguera” (Milan, Postmedia 2010). Christian Costa is an Italian/Polish artist and writer, based in Naples and Warsaw. His research is focused mainly on public art long-term projects, used as tools to explore the idea of place as a medium and the consequencies politics and socio-economic processes have on cultural perception of space. He showed his work in many countries and in projects/occasions such as the Venice Biennale, the World Expo, the Liverpool Biennial, the European Culture Congress, etc. He is part of the long-term public art projects Progetto Isole (based in Palermo, since 2005 – www.progettoisole.org), N.EST (based in Naples, since 2007 – www.nestube.com) and Wroclaw – wejscie od podworza (Wroclaw, since 2013). In 2008 he founded, together with the artist Fabrizio Ajello, the ongoing public art project Spazi Docili [Docile Spaces], focused on the city of Florence, interpreted as a brand and as the undisputed capital of Italian difficulties in understanding and dealing with ‘the contemporary’. The name, clearly referencing Michel Foucault, postulates the existence of spaces – which are ‘docile’ to the ‘Power’ – where the incompetence of the Italian political-bureaucratic-administrative class takes a touchable, concrete form. The website is: www.spazidocili.org. Lieven De Cauter is a Belgian philosopher, art historian and writer. He teaches philosophy of culture in the Department of Architecture of KULeuven, Luca, and RITS, school of arts. He published some dozen books: on contemporary art, experience and modernity, on Walter Benjamin and more recently on architecture, the city and politics. Besides this he published poems, columns, statements, pamphlets and opinion pieces in newspapers and on the web. His latest books in English: The Capsular Civilization. On the City in the Age of Fear (2004); Heterotopia and the city. Public space in a postcivil society (2008), co-edited with Michiel Dehaene, Art and Activism in the Age of Gloablization, co-edited with Karel van Haesebrouck and Ruben De Roo (2011), and Entropic Empire. On the City of Man in the Age of Fear (2012). He is founder of the BRussells Tribunal (www.brusselstribunal.org). Anna Detheridge is an art theorist, curator and lecturer on the Visual Arts. She has taught Visual Arts in a number of universities and colleges including the Bocconi University in Milan; the Faculty of Industrial Design at the Politecnico in Milan; Master class in Art and Landscape Design at the Brera Academy of Fine Arts. She worked for many years (from 1987 to 2003) as chief editor of the Arts pages of the Italian financial daily Il Sole 24Ore and has curated exhibitions such as Public Art in Italy at the Pistoletto Foundation, Cittadellarte, Biella 2003; INNATURA, tenth Photography Biennial at Palazzo Bricherasio, Turin 2003; Village Global, retrospective exhibition on the Sixties at the Musée des Beaux Arts in Montreal 2004 as guest curator. In 2001 she founded the non profit cultural association Connecting Cultures, action research agency in the field of visual arts, cultural policy and education with a mission for interdisciplinary and intercultural projects. (www.connectingcultures.info) She has recently published Scultori della Speranza: l’arte nel contesto della globalizzazione, (Einaudi 2012) a major publication with an interdisciplinary approach to the visual arts after conceptualism. Martin Josephy studied architecture in Kassel and Vienna, followed by a postgraduate course at the Institute for the History and Theory of Architecture at ETH Zurich. In 2000 he returned to his hometown, Basel, where he acted as managing director of ETH Studio Basel (2002-04). Currently he runs an independent practice as urban planner and advisor for politics and local initiatives. In addition, he works as an architectural historian at the Barragan Foundation, where he contributes to a forthcoming monography on the Mexican architect Luis Barragán. Peter Lang is professor in Architecture History and Theory at the Royal Institute of Art, in the Department of Architecture, Stockholm (Kungl. Konsthögskolans, Mejan Arc). There he teaches a post-graduate class on architectural theory urban culture, media and practice. He holds a Bachelor in Architecture from Syracuse University (1980) and a Ph.D. in history and urban studies from NYU (2000). Peter Lang writes on the history and theory of post-war Italian architecture, with a focus on sixties Italian experimental design, media and environments. Together with Luca Molinari and Mark Wasiuta, Peter Lang recently co-curated the exhibition Environments and Counter Environments: Italy: The New Domestic Landscape, MoMA at the Graham Foundation in Chicago in the Fall of 2013. Peter Lang is also actively involved in urban field research principally related to the understanding of informal cities and underprivileged communities. Michael Obrist / feld72 www.feld72.at feld72 (Anne Catherine Fleith, Michael Obrist, Mario Paintner, Richard Scheich, Peter Zoderer) is a collective exploring the intersection between architecture, applied urbanism and art. The office based in Vienna has realized numerous buildings, urban interventions in public space, masterplans andresearches in an international context. The work of feld72 has been exhibited in numerous Biennales: Venezia 2011 / 2010 / 2008 / 2004, Shenzhen / Hongkong 2009, Canaries 2009, Art Triennial of Guangzhou 2008, Sao Paulo 2007, Rotterdam 2003. Besides having won numerous awards (National Award of Austria for Experimental Architecture, National Award of Austria for Architecture and Sustainability, Architecture Award Southtyrol in 2 categories (Housing / Public Building),contractworld award, AR award for emerging architects, Karl-Hofer-Award of the University of theArts Berlin,…), feld72 was selected by the jury of the latest Iakhov-Chernikhov-Award as one of the10 most innovative young practices worldwide. Obrist has been teaching at space&designstrategies at the University for the Arts in Linz (AT), TU Vienna (AT), Bergen School of Architecture (NO) and was leading a masterclass at Bauhaus Dessau Summer School (DE) as well as in the Fondazione Antonio Presti / Fiumara d´Arte in Sicily(IT). Pelin Tan, trained in sociology and art history, is a researcher, writer and an associated professor and vice dean of the Faculty of Architecture, Mardin Artuklu University. Lecture: Transversal Dictionary Abstract: Spatial practices in conflicted urban spaces instigated society to invent a new collective dictionary not only for the constrained environment of the recent socio-political and economic crisis, but also to rebuild a collective consciousness that can refer to our communal co-existence. In this context, it is urgent that curatorial practices need to be altered from their institutional structure with certain representation formats. The production of curatorial formats is not only about searching for representation, which is somewhere in the imagination of the horizon, but also is about transversing practices and knowledge production according our collective everyday life actions. Whoami (whoami.it) is an educational project created by Abadir (www.abadir.net) and IdLab (www.viacascia6.it) in the interest of adapting education to a changing world. Whoami uses the dynamics of new media and communication to assist learning processes, and the involvement and participation of students in order to create a community that stimulates energetic, collaborative and open attitudes. Whoami is active in the contemporary design world, and connects professionals, businesses, places and systems to train designers to be able to deal with a world in transformation. Whoami offers traveling master’s courses that involve online and offline activities, MOOCs, theme projects and cooperation efforts with schools and businesses. ON/laguna is a collective recently founded on the experience of working on abandoned spaces for the activation of new relation in between people, associations and institution, human and natural environment. The research in which the group is involved investigate effective strategies to realise participatory project in which people are directly involved with the urban transformation with the aim to built real processes of regeneration based on the existing spatial, socio-economical and environmental potentialities. Giulia Mazzorin is a venetian architect and urbanist. PHD candidate in urbanism at IUAV where she studied architecture and landscape design. In 2013 she graduated in the post graduate Europen Master of Urbanism (EMU). Since 2007 Giulia is working with Andrea Curtoni, on urban projects developed togeth er with communities and associations in different contexts like developing countries, USA and Europe. In venice she is a member of the Teatro Marinoni Bene Comune, co-curator of the projects faREte and CantiereOaM. She is co-founder of ON/Laguna. Andrea Curtoni is an architect and urbanist, based in Venice. He graduated at the European Postgraduate Master in Urbanism (EMU) with an exchange program at Parsons, The New School for Design (NYC). He is Phd candidate and he is working as teaching assistant for urban design courses at IUAV and EMU.Since 2012 is a member of the Teatro Marinoni Bene Comune working towards the re-appropriation of different spaces at ex Ospedale al Mare.He is co-founder of ON/Laguna.